Every order above $2,500. Largest DIY materials selection. Privacy, picket and post-and-rail designs. Fast, low-cost shipping. Installing your own Bufftech PVC Vinyl Fence by CertainTeed is a great way to save money and take pride in your DIY project. Bufftech Vinyl fences are easy to install and come with complete, detailed installation instructions in every package. The lightweight materials and carefully designed installation features let you complete a professional looking fence in less time than you’d think. While you can install a fence by yourself, the job is much simpler and goes faster with a capable helper. The key to successful installation is to follow manufacturer instructions to the letter, take your time, and check fence alignment constantly as you go. We supply fence panels, pickets, posts, gates and accessories of all styles at discount prices. Locate pipes, wires, and other underground structures by contacting utility companies or a location service, and check local agencies for fence code requirements. Read the manufacturer’s installation instructions for your particular style and familiarize yourself with the procedures in advance of the actual installation. 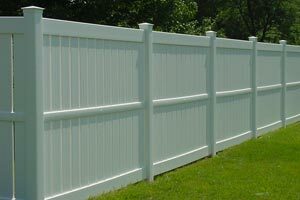 Stake the corners of your fence layout and run string lines to align with the outsides of vinyl fence posts. Mark the location of all posts, following the spacing instructions for your particular vinyl fence model. Pay special attention to gate post locations, as specified in the detailed instructions to allow for gate hardware. Dig holes for fence posts, to the diameter and depth recommended in your detailed instructions. You can dig all postholes at the same time or dig them as you go. A power posthole auger, rented from a local equipment rental outlet, can make short work of this job. Start at a Gate Post to begin installation, then work in one direction from there. Place the first gate post in its hole, adjusting the height as desired, using a wood block and mallet where necessary. Mix Concrete Mix to a thick consistency and backfill the posthole, leaving 2-3" above the concrete for backfilling and reseeding. Use the long bubble level to make sure the post is plumb in both directions. 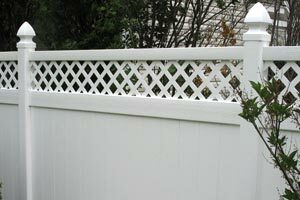 Install a Vinyl Fence Panel, following the detailed instructions that came with your shipment. Then, install the next post, fitting it to the fence panel. Panels can be raked to follow the slope of your property. It may help to block up the panel’s bottom rail at the desired height. Tip: Leave any thin film shrink wrap material on the components to prevent scratches during construction. You can remove this later. Use a Wood Block and mallet to adjust post heights as you proceed. Continue Installing Fence Posts and fence panel sections, always working in the same direction. As you work, be sure to keep checking behind you, sighting down the fence line and checking previously installed posts to make sure they’re plumb and level. The more care you take with this, the better your fence will look. Remember that you can’t adjust posts once the concrete sets. Hang Gates and install post caps and other features, once you’ve completed all post and panel installation. At every stage, follow the manufacturer’s detailed instructions carefully, and don’t take shortcuts. 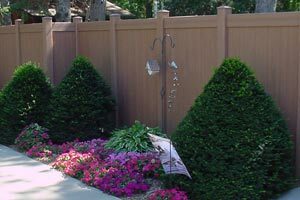 Each fence style has its own unique installation methods and requirements. Finish the Fence, after letting it rest for a day or two to allow concrete to set fully. Avoid opening gates until then. Remove any shrink wrap from the fence, backfill the tops of post holes and reseed, if necessary. Then stand back and take pride in your finished project. You’ve earned it. Building a DIY vinyl fence saves you money. You will save even more with our low prices on fence boards, panels, posts, and gates. We have a leading supplier of fencing materials in the US and our volume discounts allow us to offer our customers the best prices available. Our factory direct shipping means even more savings of your total cost. No matter what type of fence you plan to build, our experienced staff will be glad to help you with selection, pricing and installation. Bufftech PVC Vinyl Fences from CertainTeed are a great choice for DIY installation. Easy to assemble by design, these lightweight, durable, low-maintenance vinyl fences come with complete and detailed DIY instructions from the manufacturer that take you step-by-step through a successful installation. 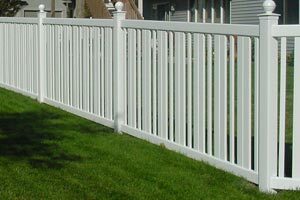 Our fence supply company is proud to offer Bufftech fence products to our DIY customers because we know you’ll have great success in creating a beautiful fence you’ll enjoy for decades. Contact us soon to discuss your fence plans or request a price quote. We’ll help you create a complete materials list from your dimensioned sketch, answer all of your questions, and get your fence materials on their way to you from the manufacturer. Join the many DIY fence builders who have already purchased their fence from International Security Products.